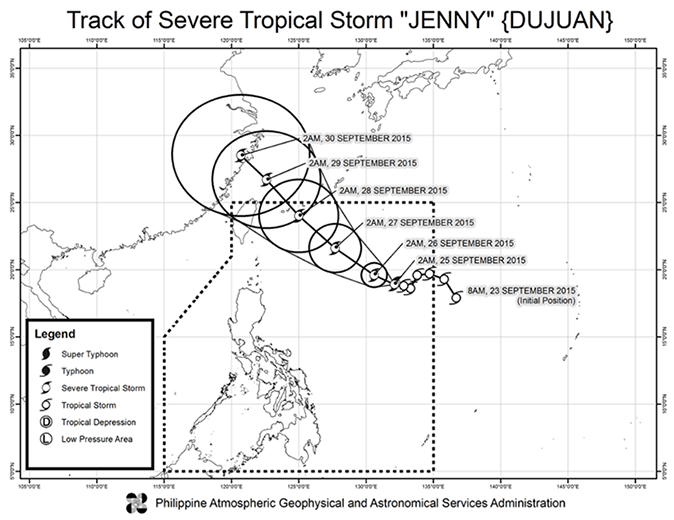 News updates about Bagyong Jenny, a Severe Tropical Storm, as of Friday, September 25, 2015, from the state weather bureau PAGASA are posted here. At 4:00 AM today, the center of Bagyong Jenny was spotted 1,120 kilometers east of Calayan Island, Cagayan with maximum sustained winds of 95 kilometers per hour near the center and gustiness of up to 120 kph. It is forecast to move West Northwest at 7 kph. State forecasters said the southwest monsoon is affecting Visayas and Mindanao. Cloudy skies with light to moderate rains and isolated thunderstorms will be experienced over Mimaropa, Calabarzon, Bicol Region, Visayas and Mindanao. Partly cloudy to cloudy skies with isolated thunderstorms will prevail over Metro Manila and the rest of Luzon. Moderate to strong winds blowing from the northwest to west will prevail over Luzon and coming from the southwest over Visayas and Mindanao. 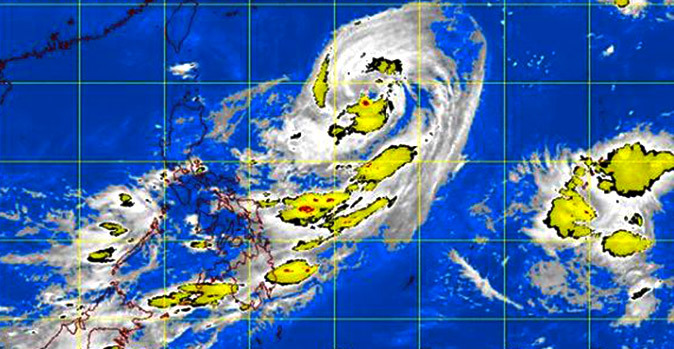 The coastal waters throughout the archipelago will be moderate to rough, PAGASA added.